I’m re-doing some things on my Garrard 301, adding another arm board and redoing the current one. was wondering what people are using if anything for interface between the arm board wood and plinth wood. I could also use a metal for the arm board if that’s better. I was using a small bead of blue tack (ok the stuff i got is white but the same idea) between the arm board and plinth for a more even connection and maybe some isolation, then screws. Some one mentioned its better to have a more solid connection. I have though about a hard rubber maybe as a gasket type of idea, or should I just screw it down wood on wood. metal on wood etc. The more closely you can make it to the plinth and arm board being like one piece the better. So if the arm board you have is perfectly flat then just screw it down because adding anything between will only detract from that. But if it is anything less than perfectly flat, if there are any voids or gaps, then using a very thin layer of Blu-tack will likely help. I've compared quite a few different materials- from exotic hardwoods to pine and oak, to MDF, acrylic, ABS, etc as well as combinations of some of these laminated together. Bottom line, all these common materials have so many tradeoffs (ie none is truly superior to any other) that it comes down to personal preference. That's the bad news- its a crap shoot. The good news is all these are cheap and easy to experiment with. This by the way is why so many turntables are made with these same materials. Its not that they are particularly good or effective. Its that they are cheap and easy to experiment with. Look how many variations VPI and others have on what is really just MDF/acrylic/aluminum. The only somewhat commonly available material that is clearly superior in terms of vibration control is carbon fiber. Even here its not the carbon fiber that's definitive, but the way its used. I know, having built my share. The composite that forms the bulk of the material is every bit as important as the carbon fiber fabric you see on the outside. Maybe even more so. What this means is you have three main options: One, select a hardwood you think looks really good. Two, use MDF. Won't look as good but there's a reason MDF is used so extensively: its sonic signature is benign. Third, no nevermind you won't do it. Do one of the other ones. I don't claim to have a lot of experience with different armboards for the Garrard 301 but I did recently buy a mint condition Garrard 301 and I am having a plinth built. Mine will be layers of solid cherry and birch ply. I intend to mount my Reed 3P directly to the plinth. IMHO, having a pocket under the armboard (as so many stock plinths do) is an immediate compromise. There are some fancy (read; expensive) Garrard plinths out there with multiple armboards that fold in and out from the plinth to support different length arms. Again, IMHO, this looks nifty but is a compromise. I believe that somewhere along the way, smart people figured out that with an idler, it is best to have one common resonance running through the entire plinth and tonearm mount. Otherwise, tonearm mounts would be completely isolated from the plinth. This approach-the completely isolated tonearm mount-is sometimes seen with exotic belt drive tables, but not idlers. You seem to be on that wavelength already so why do you need an armboard? The answer may be that you want to be able to swap out tonearms without a marred plinth (perfectly understandable) or that you need the extra height to achieve proper VTA, particularly if you have an after-market platter. So my own opinion-driven by reliance upon blind luck and intuition-is that different woods or materials screwed down to the plinth (why use adhesive and be, uh, stuck with it?) would have a small effect on sound. Someone with far more experience than I (my plinth builder in the UK) says that layers of birch ply is the most neutral and that solid cherry is the most warm. I guess by layering the two, I hope to split the difference. I agree with Millercarbon that if the arm is to be mounted directly to the plinth, the plinth must be perfectly flat but it seems to me that adding an armboard screwed down to the solid plinth makes achieving a perfectly flat-relative to the platter-mounting surface even more difficult to achieve. I might mention (and will) that I also have a TD124 and at one time I experimented with 4 or 5 different armboards including one made of aircraft grade aluminum and yes, they all sounded different but that is an entirely different deck with the chassis supporting the armboard-unlike the Garrard. I had a plinth made by a local man who has made many plinths for both Garrard's and TD124's, good friend has two or three of his plinths all beautiful and effective. Mine is a multi layered Bamboo ply with some insets for decoration. my current arm board is made of Padauk (I love this wood simply beautiful) I cannot unfortunately get another piece to match so i'm going to get two made so I have options in materials. I have a stepped hole bored through for the tone arm cable other then that and the stepped larger hole for the table its solid. there is pictures in my system. I will be most likely boring another hole for the second arm. My plinth-table combo is close to a hundred pounds, it's true and flat but I do need a little height for the Jelco so my arm board is about 1.5" thick so when installed, it's recessed 1/2", it's about an inch above the plinth. I've been happy so far still not quite finished but 90% there just the second arm and some permanent footers I can live with. oh the second arm is most likely going to be an SME 3009 series 2 mk2 as I have one sitting on my floor next to the audio rack, a friend wants to sell me. its got new knife edge bearings and Cardas rewire straight through cabling. I’m surious what are you gonna use under the plinth ? 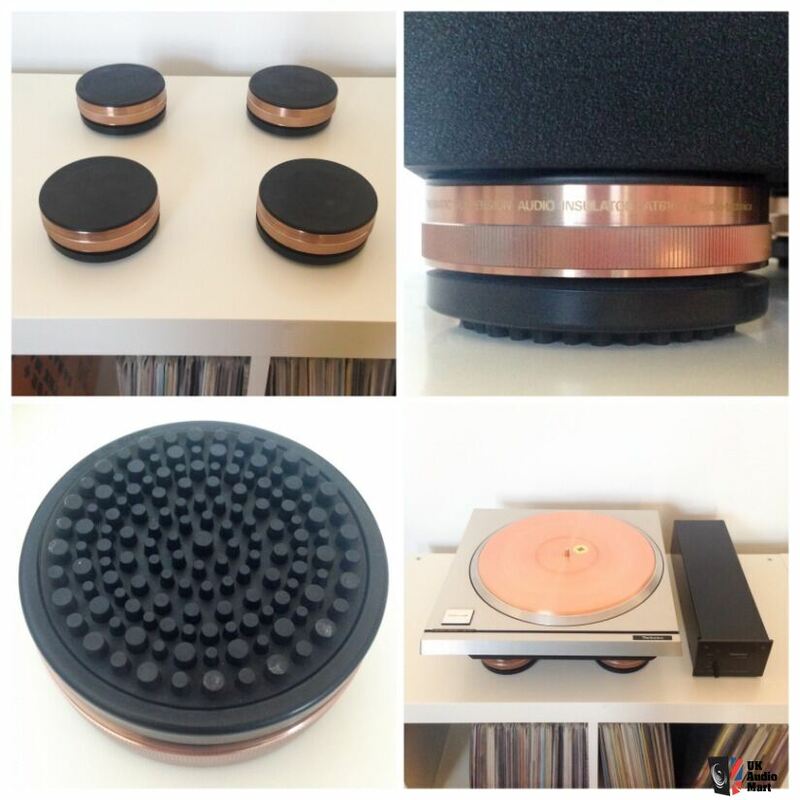 I’ve seen stillpoints under the most expensive Garrard 301 plinth. Personally i’ve been using AT616 under Direct Drive tunrtable, these Pnaumatic Insulators supports up to 132lbs (60kg). I was wondering about the weight of Garrard plinth, but now i see your plinth is 130lbs. So i can recommend Pneumatic Insulators AT616, they are superb and fully andjustable to level your TT! I think it is very important (for any turntable) what's under the plinth. I've had good luck with my 6" layered MDF plinth, Solid Purpleheart slabs, using 1" face board, 3/8" Purpleheart top and side plates, for my Garrard 401/Denon 103R. Purpleheart arm board is solidly affixed to the plinth using stainless allen screws. The whole assembly is around 70lbs. It has Edensound Bear Paw brass footers (@6 lbs. ea.) on a Brightstar Audio BigRock 2, sitting on a wall-mount stand. It has been very rewarding to listen to since I finished it a couple of years ago. The best thing by far to use under a nice massive stiff table like yours is a set of Black Diamond Racing Cones screwed into Those Things screwed into the base. I believe you tried everything to say the simple cones are the best? Do you understand what is preumatic insulators such as AT616? Even Raul has been using them under his subwoofers (good idea) where the cones are most common solution. Actually the cones are what we would like to replace with a better things such as Pneumatic AT616 or something different like Stillpoints for improvement. What do you mean, "the simple cones are the best?" my temporary footer set up is a steal cone sitting in a brass disc with a dimple with some very thin (1/16") sorbothane pads under each brass disc. this has been good but not the best as it floats and may not be that stable specially if bumped. I've tried a softer footer and I found the sound lost some focus, the cones seem best so far but i'd like a little more isolation if I can. thanks for the suggestions. I will look into the links. My footers sit on a 160lb, 4" thick granite slab. that sits on a three legged Lovan stand. I have about all the mass I can take with out it going through the floor (ok exaggeration). I can not wall mount in my current condo-loft unfortunately but I'm in a steel and concrete building that's also diagonally braced for earth quake resistance so surprisingly stable. 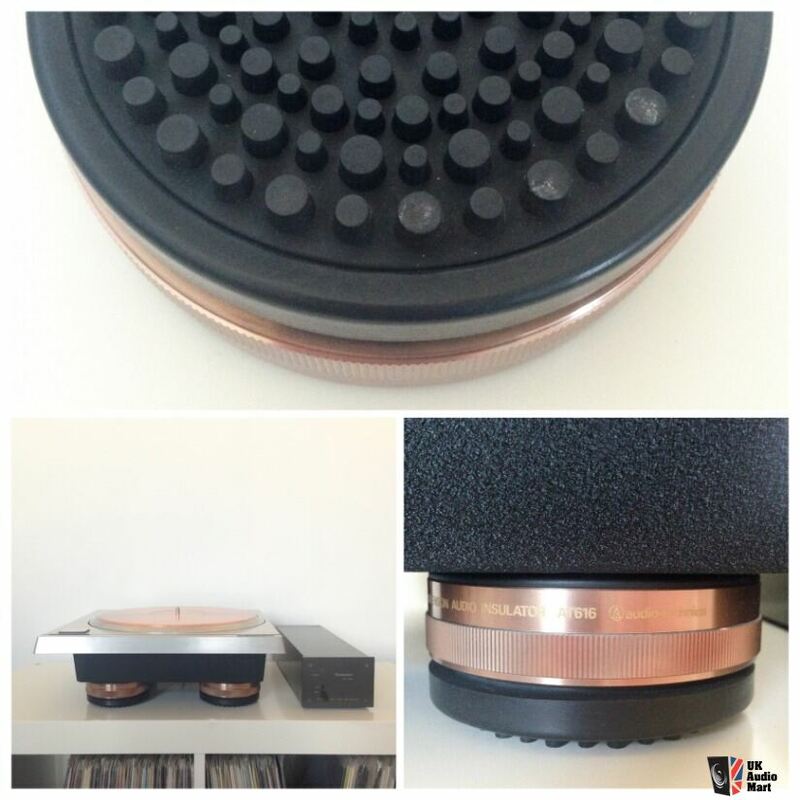 I know that cones are not the best for turntable, but what you have posted in this link is cones ? my temporary footer set up is a steal cone sitting in a brass disc with a dimple with some very thin (1/16") sorbothane pads under each brass disc. this has been good but not the best as it floats and may not be that stable specially if bumped. I've tried a softer footer and I found the sound lost some focus, the cones seem best so far but i'd like a little more isolation if I can. Exactly. 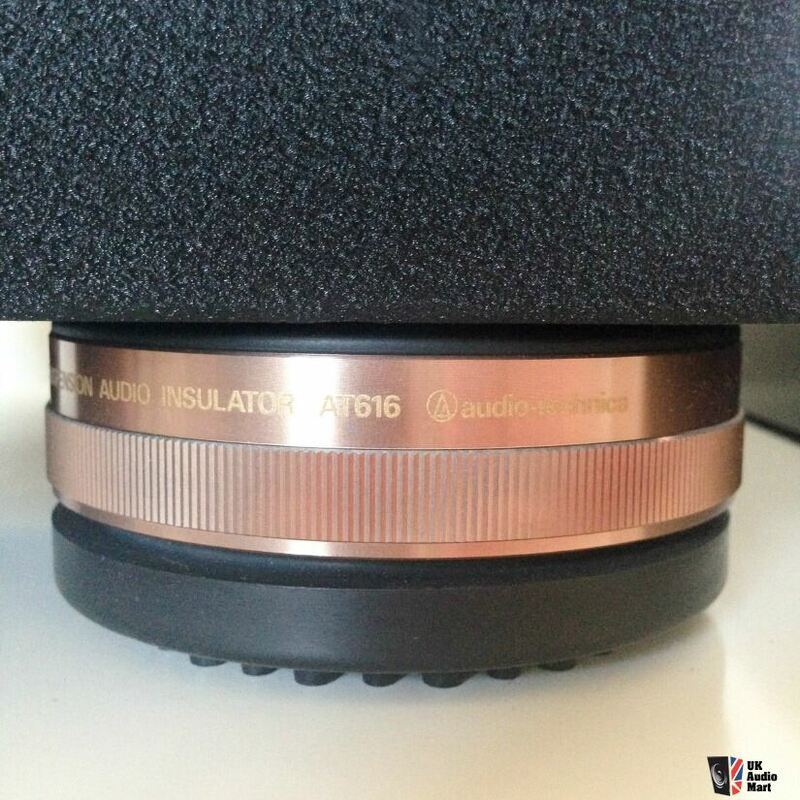 Simply search audiogon for feedbacks about those AT616 pneumatic insulators for tables up to 130 lbs (on 4 of them) or heavier table if you can add more AT616.